After years of dragging my feet, I finally decided that it was finally time to get my KTMA bots built. But how could I make this as complicated and stressful as possible? How about waiting until 24 hours before the farewell performance of Cinematic Titanic and likely one of my last chances to talk to the father of the MST3K bots face to face? We've all heard the story about how Joel built the bots overnight before the first filming, and about how the paint was still wet when the cameras rolled... but was it really possible for a modern bot builder to build screen accurate (or at least as close to screen accurate as possible) in say... 12 hours? Thus was born "The KTMA Challenge." Gentlemen (and ladies), let's light this candle. I present to you the product of countless hours of searching eBay, contacting dozens of experts on European traffic cones, and wondering where all my free time went. A Makerbot replicated KTMA Servo hoverskirt. Sure, it's not perfect, but until the original part can be found, cast, and made publicly available, this is about as good (and ugly) as it gets. A confession: Since Joel had the luxury of just buying a cone, and cutting the top off, I call the prep time of my replica a wash in the overall project built time... but for the record, the blue "segments" took an hour and 5 minutes to print, and the red "segments" took an hour and fifteen minutes to print. Eight blue + sixteen red = lots of time baby sitting the 3D printer. All the parts in one place. I used screenshots from the old BBI Scrapbook tape, and some screenshots donated by Synamax to try and get the angles right on the pauldrons... it came out OK.
Painting went OK... except that after this shot, my hands were too dirty to pick the camera up again for a while. Yes, those are 40mm ping pong balls.... I had ran out of 38mm... guess I need to get in the time machine and order some. Fast forward twenty four hours and we're at the CT show! ...and look who I bumped into - Bob Bukoski of MST3KBots.com! Joel said "Oh, wow!" and pulled out his camera to take a few shots. He was pretty impressed to see some KTMA era bots... and ask me a few questions about construction, and about the 3D printed hoverskirt. Absolutely phenomenal job, Ron. The skirt looks perfect and I love how you recreated the appearance of the poorly applied gaffer tape cummerbund. How did you attach the arms for Servo? How did you attach the arms for Servo? I attach them with a machine screw and a couple of washers to stop the head of the screw of popping through the tub. As far as where I attached them, I drilled a pilot hole in the barrel 1/2 inch above the top band (centered as you see fit around the circumference). I then measured down 3 "bumps" from the top on the arms and drilled a hole that penetrated and exited both sides of the arm tube. I then fed the screw and washer in from the inside/top where it only exited from one side. Then I inserted the thin screw driver thought the "access" hole and tighten it down securing it with a nut and washer inside the barrel. This allowed me to obscure all the fasteners, and yet be able to "move" the arms in an arc and have them stay in place. I can post some pictures if you want. I'm with you... but I guess Joel keeping going on record that it was a European style traffic cone... even though I've never been able to find a picture of one that comes close. So cool! So very, very ugly! But so cool! How come no one has tried to make a KTMA Gypsy or KTMA Cambot ? It's a smaller than the original seat, and I've only found one ever. KTMA Cambot would be pretty tough... to my knowledge, a 100% accurate list of parts doesn't exist. I'm gonna build KTMA Servo and Crow eventually, could you put the traffic cone on thingiverse? also where did you get that resin soapdish? 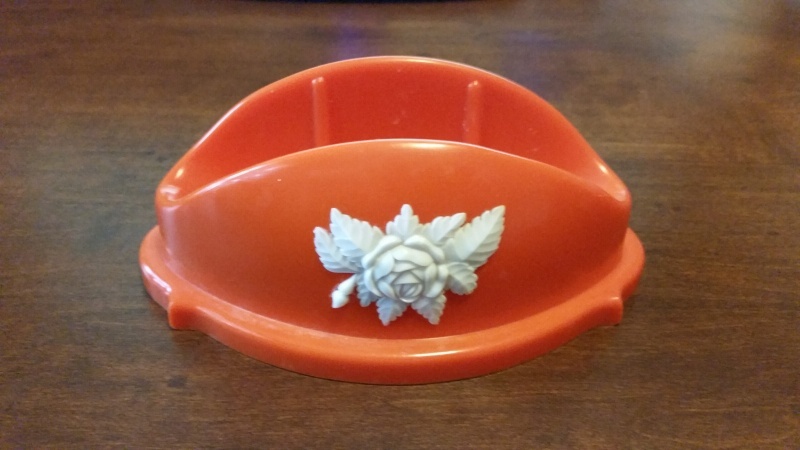 I've got a soap dish that I got on EBay without much trouble, before I knew it wasn't useful for a "modern" Crow. If you set up an email alert for "Schwarz Bros soap dish" they come up once in awhile. I see you also posted asking about Cooper XL7's - they're also pretty common on Ebay. In fact there's one up for sale right now. "...could you put the traffic cone on thingiverse?" what are the shoulder pieces on your Servo, please Ron? My favorite part of this story is that in the pictures, Rons basement just has random botparts all over. The shoulder pieces are original Crown pins cut to size.